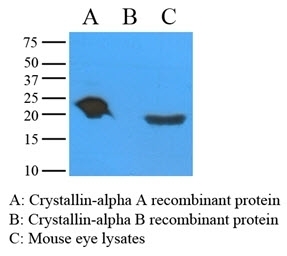 Western blotting analysis of recombinant crystallin proteins and mouse eye derived lysates probed with Mouse anti Human alpha crystallin (MCA2696). Mouse anti Human Alpha A Crystallin antibody, clone c9F2 recognizes alpha A crystallin, a 20 kDa water-soluble major structural protein and member of the heat shock protein family, designated HSPB4, which acts as a molecular chaperone and is believed to play a role in the maintenance of ocular lens transparency/refractive index. Besides the involvement of both alpha A and alpha B crystallin in the prevention of protein precipitation and cataract formation in the eye, alpha crystallins have also been demonstrated in other tissues including the heart, brain, kidney, spleen and thymus. E. coli-derived recombinant protein corresponding to full-length (aa1-173) human crystallin alpha A.
Andley UP et al. (1996) Cloning, expression, and chaperone-like activity of human alphaA-crystallin. J Biol Chem. 271 (50): 31973-80.